Sailors of the USS Mason (DE-529) commissioned at Boston Navy Yard on 20 March 1944 outside the ship, which was the first to have a predominately black crew. African American US sailors who received a welcome fit for heroes on arrival in Derry during World War II are to be honoured at a reception in the city later this year. The US Mason ship made history back in 1943 because its crew was mainly African American, with the sailors onboard later proving themselves vital to winning the Battle of the Atlantic. The welcome that the US Mason crew got in Derry from local citizens has not been forgotten. They were made welcome and treated as equals in the bars and dance halls of the city. There are now plans to bring another US Mason ship, built and named in honour of these men, to the city this summer, with a welcome reception for the crew. Launched on November 17, 1943, the original ship carried an enlisted crew of 160 black sailors and five white officers. Prior to the Mason, black men in the Navy had been limited to support roles such as cooks, stewards and labourers, and even had to wear different uniforms than those worn by other sailors. The commissioning of the original Mason ship came about as a result of intense pressure from then First Lady Eleanor Roosevelt and others to integrate the armed forces. 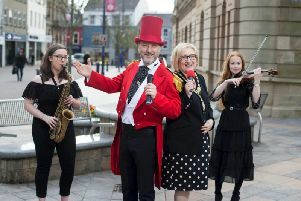 Reporting before Derry & Strabane’s Business & Culture Committee, Council’s Head of Marketing Linda Williams stated that the “transition wasn’t easy, with the Mason’s crew forced to confront intense racism in the naval ranks and a widespread belief that the ‘social experiment’ would fail”. “The men of the Mason responded to the hostility and doubts by performing their duty, which often times was dangerous, with extraordinary bravery and dedication,” she said. “Their exploits while escorting supply ships and intercepting German U-boat messages in the Atlantic Ocean and the Mediterranean Sea were chronicled by African American journalist Thomas W. Young, who was commissioned by the Navy as a war correspondent aboard the Mason. “The welcome that the US Mason crew got in Derry from local citizens has not been forgotten. They were made welcome and treated as equals in the bars and dance halls of the city. In 2004, the book was made into the movie Proud, starring renowned actor and activist Ossie Davis in his final film role as Signalman Second Class Lorenzo Du Fau, the last surviving member of the Mason crew. The growing clamour to recognize the contributions of the men of the Mason resulted in the Navy finally awarding the long-delayed commendation to surviving crew members in 1995. The committee was told that Dr Mary Pat Kelly is now keen to bring the new US Mason to Derry “to recognise the courage and commitment of the Mason’s crew who helped pave the way for the integration of the armed forces by President Truman in 1948”. “The story of the US Mason has key links with DCSDC’s planned £11m Maritime Museum opening 2019 on the Ebrington site,” Councillors were told. “The story of the Mason and crew is being addressed in the new National Museum of African American History and Culture, opening 2016. This museum is the newest member of the Smithsonian Institution’s family and will be far more than a collection of objects. “A visit by the US Mason will help to cement links between the Maritime Museum and the Smithsonian, as well as with the US Military archives, who in partnership with Dr Kelly, are keen to create shared archives. The welcome will include a Mayoral drinks reception, welcome dinner and musical celebration. Costs to the council are estimated to be in the region of £5,000 to include the welcome reception and site visits to key locations in and around the region. The committee gave authorisation for council officers to progress options for the planned US Mason visit and plan to bring back final programme and funding proposals to members for consideration. Proposing this, SDLP Councillor John Boyle said that it was very important that the links between the Mason and Derry were explored further. He also said that the story of the US Mason was a “poignant” one.